It is said that with the invention of phones with in-built cameras that there will be more photographs taken this year than previously taken in the entire history of photography. The camera phone has also lead to another interesting anomaly. The creation of the selfography. People whom only take photographs of either themselves of the meals they eat. 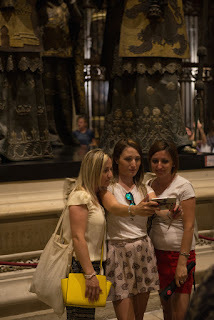 Visiting tourist locations the selfographer is easy to spot. They are the people that spend their entire time with their back to whatever is they have travelled to see. Ironically they barely see anything. de Vinci did not create his masterpiece Mona Lisa to be a photo-bomb image for social media. Sure an occasional, selective, selfie is a good way to prove you were actually there. The emphasis is on occasional. Some people now approach travel like a pantomime…it’s behind you. These people only see items of historic importance, religious significance and artistic beauty on a small screen held at arms length, or even worse at the end of a telescopic pole held slightly above to create a strong jawline and then for some reason smiling is not allowed, just like a football team photo. Instead selfographers are compelled to pucker, as though they are blowing a kiss. Weirdly they are on the screen in front of them, which means they are blowing a kiss to themselves. Turn around, it is right there. Take photographs to capture the items wonder. Take lots of photographs. Despite what selfographers believe, the ceiling of the Sistine Chapel is complete, Michaelangelo did not leave a space hoping that one do someone’s travel-weary face will be added so that it looks like God is giving them a wet-willy.